When Caleb turned 12 months, we finally got professional family pictures for the first time! I knew that I wanted to add a family picture to our gallery wall in the living room. The only problem was I didn’t have a frame big enough for the picture since I wanted it to have a mat around it. After searching a few weeks, I finally found a frame at our favorite thrift store. It was in the clearance bin, marked down from $4 to $1. Plus the store was having a sale, 25% off all frames. I ended up getting the frame and mat for 75 cents! Here’s how it started. I took out the faded picture, cleaned up the frame and glass, and added our family portrait. I think it looks great and fits in well with the rest of the pictures. I had to rearrange a few things, but I didn’t get too technical. My pictures are not perfectly spaced out, and I’m sure that bothers some people. But I love how it turned out! I think the mismatched, imperfectness of the wall makes our feel more casual and comfortable. You can see my original gallery wall and my inspiration for it here. 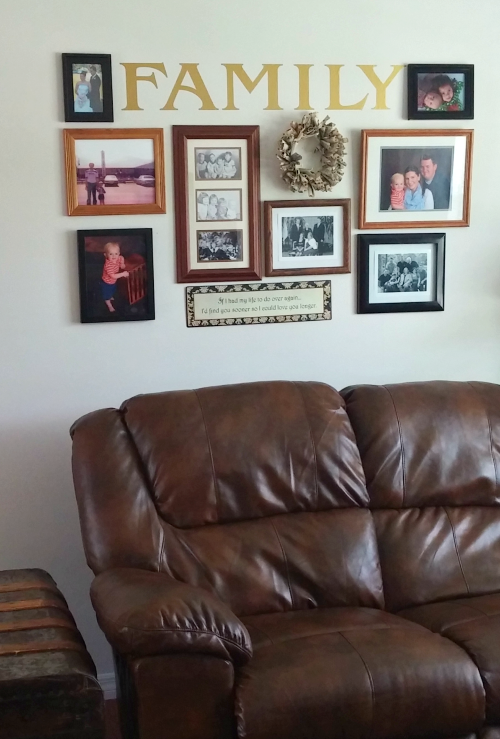 Do you use family pictures as wall decor too? I love how it turned out too. I have family pictures up but not anything that is grouped together so nice. I just may have to copy you a little! Hope that's okay! Have a great day! Of course you can copy, Vickie! 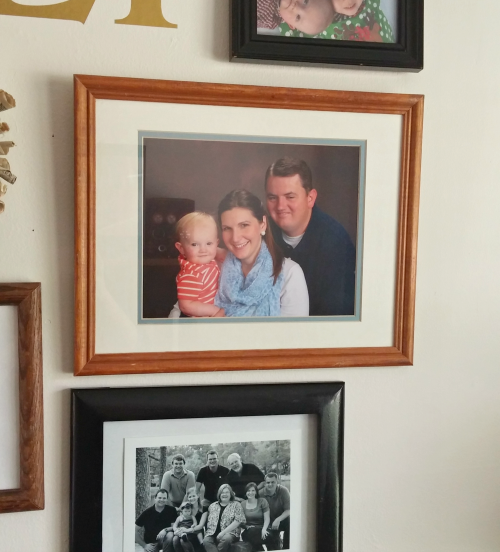 I love when I see other people using family pictures in their homes. It reminds you that their have been lots of memories made there! I hope you have a great day too! Love this gallery wall! We haven't done one as formally (with the actual picture frames) we just have taped the pictures on the wall, haha. I am in love with yours. Thanks for letting me know, Liz. I'll have to check into changing that. Hey, as long as you have pictures on the wall, I think that works!